Are cochlear implants suitable for children? A child who is so deaf that he/she cannot benefit from the most powerful hearing aids is deprived of hearing the everyday sounds that we take for granted – the conversation of their family. Without hearing others speak it is almost impossible for a child to develop spoken language, thus presenting significant difficulties in educational attainment, employment prospects and quality of life. A cochlear implant can give these children renewed hope for the future by providing useful hearing with access to environmental sounds and spoken language. With appropriate post cochlear implant care and support, these children have the opportunity to develop intelligible spoken language themselves with all that this offers for their futures. Over 1000 children are born deaf each year in the UK and they are now identified very early by the national neonatal hearing screening programme. There are in addition children who suffer progressive hearing loss or acquired deafness, following meningitis or resulting from other causes. In some of these cases, an implant may be suitable for the child. Children are not normally given an implant before they are one year old, but if a child, who is born deaf, is to get the full benefit from an implant, then it is best that they are given the implant as young as possible, preferably before they are five years old. 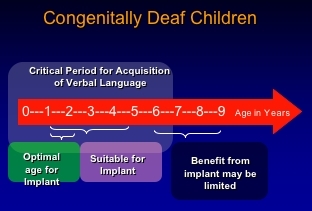 This is the most important time for learning language and up to this age a child will be more likely to learn to identify the ‘sounds’ that the implant produces. There has been a lot of debate about implants for children. Some people argue that a child shouldn’t have an implant until they are 16 and able to give their own consent to have one fitted. Unfortunately, anyone who is born deaf and not implanted until that age would not be likely to benefit very much from the implant. A cochlear implant would, however, be very helpful to a teenager who was born hearing and became deaf in later childhood, after they had acquired language skills through listening and talking. What choices are there for my child? Most deaf children will have some hearing and will be able to gain a certain amount of benefit from hearing aids. Some profoundly deaf children find that their most effective means of communication is by using sign language. Others will use hearing aids, a cochlear implant, or a combination of such technology with sign language. If your child has very little hearing, and is gaining no real benefit from traditional hearing aids, a cochlear implant may be one of the options to consider. Naturally with very small children, who probably have no language or speech, it is their parents who have to make the decision about implantation. Older children need to be involved as much as possible in the decision to have, or not to have, a cochlear implant. While cochlear implants are not a cure for deafness, the performance of children who have had cochlear implants is more like that of a severely deaf child than of a profoundly deaf child. Some do very well indeed and are holding their own in mainstream education while others have been placed in special schools. Sometimes this is because they have additional problems, such as language processing difficulties, which makes it necessary for them to have more support from teachers of the deaf. There are deaf people who are opposed to cochlear implants and believe deaf children should learn to sign and become members of the deaf community. Some children with cochlear implants use sign and oral methods of communication together. Others, who started out signing, change to oral communication of their own volition. Because all deaf children have different needs, the way in which they will achieve effective communication will vary. Some deaf children will develop spoken language with the use of hearing aids or cochlear implants, some will use manual communication, such as sign language, and some will use a combination of both. Is a cochlear implant the best way forward for my child? When considering an implant for your child, it is important that you have access to as much information, from as many different people, as possible. Many of these people will have different views and opinions, and this can be sometimes be very confusing. Your child’s views are obviously very important and, if possible, you should try and fully involve them in the decision making process. Talking to other parents who have children with implants (or are going through the assessment process) might be helpful, and the implant team should be able to put you in contact with them. 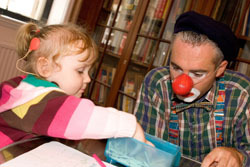 The principal aim of the Cochlear Implanted Children’s Support Group (CICS) is to provide support at any time before, during and after a child’s cochlear implant. 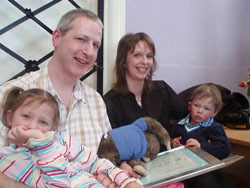 (See www.cics.org.uk for contact information for CICS).It is important to remember that, because children have different needs, not all children will become effective users of a cochlear implant. Many adults who were born deaf themselves have strong views about what helps deaf children to fulfill their potential. If you are hearing or deafened and you have a deaf child, you may want to talk to an adult who was born deaf before deciding whether your child should have an implant. You may also want to talk to families with a child who was given an implant when they were young. It is also very important to remember that a cochlear implant will not “cure” your child of their deafness. A child with a cochlear implant is still, and will always be, a deaf child regardless of how effective a user of their implant they become. The most important consideration is that your child grows up knowing they are deaf and feeling positive about their deafness, regardless of whether they have a cochlear implant, wear conventional hearing aids, and/or use sign language as their means of communication. A very recent video of a 3 month old baby having bilateral implants can be seen here. How do I know if my child will benefit from a cochlear implant? Young children who are born profoundly deaf and children, who have lost their hearing through meningitis, or other causes, may benefit from a cochlear implant. Older children who were born profoundly deaf and who use sign language as their main means of communication are likely to receive benefit from awareness of environmental sounds from a cochlear implant. Children with additional special needs, particularly those who are deaf-blind, may be given specialist assessment to see whether an implant is likely to be of benefit. has a family who is committed to the use of hearing, regardless of the child’s educational setting. If I think my child may benefit from a cochlear implant, what do I do next? For young children who were born deaf, or become deaf before acquiring speech and language, an early diagnosis of deafness is important because the window of opportunity is quite small. Children who are implanted at between one to three years of age do best. Once implanted, they usually acquire language and speech naturally through hearing unless they have other problems in addition to their deafness. Parents of children deafened by meningitis should seek expert help without delay as it may be difficult to insert the implant if the cochlea becomes ossified, or filled with bony tissue. This sometimes happens after meningitis. If you feel your child has been using hearing aids for some time and is gaining limited or no benefit from them, you should contact your ENT consultant or audiological physician. They will be able to tell you about different options for your child, including a cochlear implant if they feel this is appropriate. They may wish to discuss this first with, for example, your child’s local audiological scientist or teacher of the deaf, but the referral to the implant centre should be made by your ENT consultant or audiological physician. The assessment procedures for children take much longer than for an adult and there is also an intensive follow-up programme. An educational psychologist will also be involved and local teachers of the deaf will play an important role in the follow-up programme. These notes are, in part, an extract from “Deaf Children and Cochlear Implants” published by the NDCS.